DC Structures values good stewardship of the environment and Earth’s natural resources. This principle is echoed through our space-efficient designs and our use of responsibly sourced products, such as premium heavy timbers from the Pacific Northwest. Our appreciation for nature and our focus on efficiency inform much of our approach to building design. When you enter the design process with DC Structures, we begin by asking about your priorities. Beyond the usual need for more space, many people refer to energy efficiency and sustainability as important considerations in their overall building objectives. 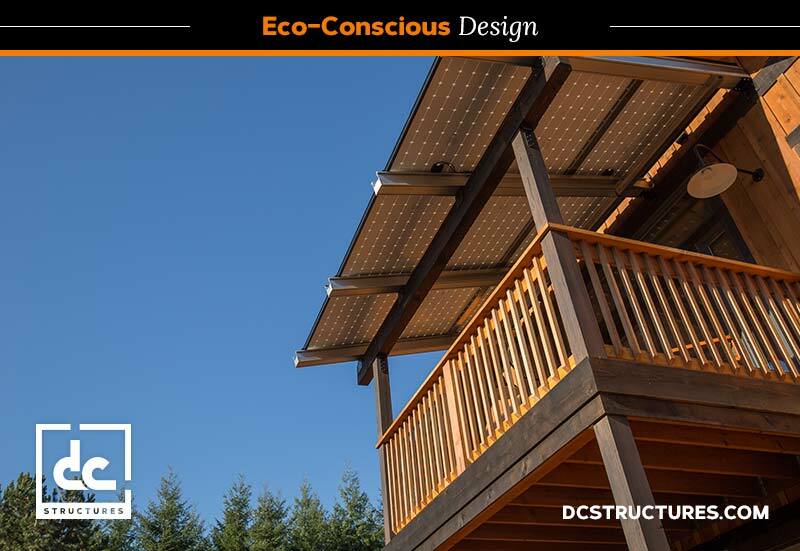 DC Structures has several eco-friendly barn designs, as well as additional options and upgrades to make any barn kit greener. When designing a barn, it’s easy to get carried away by what you want rather than what you need. But more space means more energy that’s needed for heat and light, which in turn makes for higher costs and more wasted resources. Instead of building a larger structure, consider what it is you need at the moment and design an efficient space for that purpose. If you think your needs could change down the road, choose a design that can be modified when the time comes. Like all livestock, horses carry with them a lot of dirt and dust. Between the bedding in their stalls and the hay they eat, particles of debris floating around in the stable can make it difficult to breath. That’s why it’s important to have proper ventilation systems to protect both yourself and your horses. Installing a basic industrial ventilation system is an easy solution, but will also increase your energy costs to various degrees depending on the size of the space. Instead, consider adding natural ventilation options like extra windows or custom cupolas into your design for a more efficient building. Besides dust, horses also produce a whole lot of natural waste. If you have several horses, all that manure will start to add up real fast—and figuring out what to do with it can be a stinky problem to work through. One solution is to compost the waste and repurpose it for use across your property. Our partner company, DC Builders, has a number of compost systems to show for in its portfolio, including these in Oregon City and West Linn. It’s a cost effective and sustainable way to handle horse waste. Whether you’re looking to build a new barn, or just some tips for your existing structures, trying to create a more eco-friendly property is a noble effort. Not only is it better for your land, your buildings, for you, your horses and the environment, it also stands to save you a lot of money. Start planning your next sustainable barn project today, with a free digital catalog today.